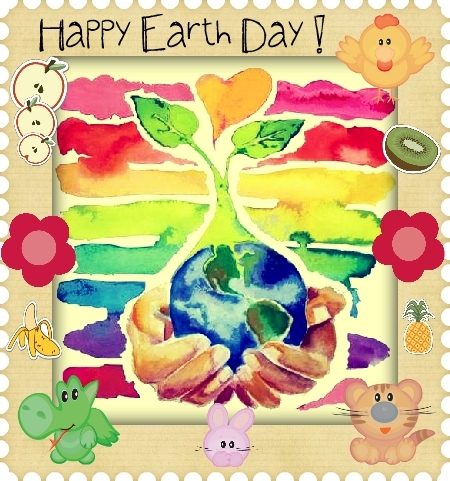 Vanity Rehab: HAPPY EARTH DAY! Really??? Can i ever..i mean ever..even in my dreams think of hurting my mom who carried me for 9 whole months in her womb,brought me in to this world, fed me, loved me a lot and is gonna love me forever? can i? Then how did i never thought about how much i was hurting my mother earth who carried me and is gonna carry me on her forever! how? This is what i felt like when i realised real late about how blind i became in the process of turning my dreams in to reality..
My artsy cravings and deeds weren't really making my mother earth feel proud of me..
We are being told to Plant more trees, Save water, Ban plastic and etc.,etc., to protect our environment but majority of us are utterly unaware of the damage which "The Beauty Industry(skincare,makeup, haircare, pet's skin/fur care etc.,etc.,) is causing to us,our environment and our fellow living beings! They are polluting our environment during the manufacture process, after going on to the skin and then in to the blood stream, after being thrown in to the trash cans, after running down the drain, after being absorbed by the trees,after making their way in to the bodies of insects and animals through their food and water and so on and on and on...!!! This is not what beauty is supposed to do..isn't it? Do we need "MOTHER'S DAY" to celebrate or more precisely remind us of our mommy's love and make her feel special just for a day? Aren't we supposed to celebrate her love and love her every single day? and the same applies to "EARTH DAY"! Do we really need a day to remind us of our love and responsibility towards mother earth and her other kids? So.like bunny said,Can't we make every day an earth day? can't we?